PASADENA, Calif -- Weird coatings on rocks beside a young Martian crater remain puzzling after a preliminary look at data from examination of the site by NASA's Opportunity rover. The rover spent six weeks investigating the crater called "Concepción" before resuming its long journey this month. The crater is about 10 meters (33 feet) in diameter. Dark rays extending from it, as seen from orbit, flagged it in advance as a target of interest because the rays suggest the crater is young. 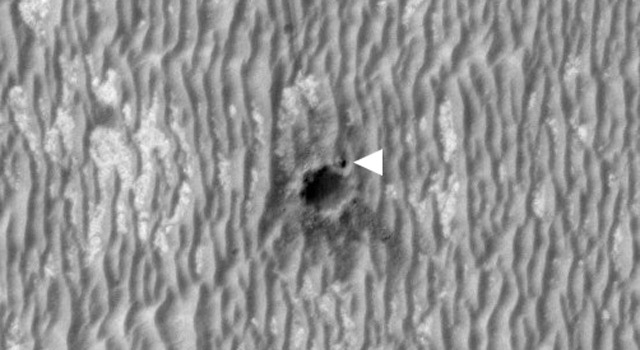 An image from orbit showing Opportunity beside Concepción is at http://photojournal.jpl.nasa.gov/catalog/PIA12969 . The rocks ejected outward from the impact that dug Concepción are chunks of the same type of bedrock Opportunity has seen at hundreds of locations since landing in January 2004: soft, sulfate-rich sandstone holding harder peppercorn-size dark spheres like berries in a muffin. The little spheres, rich in iron, gained the nickname "blueberries." 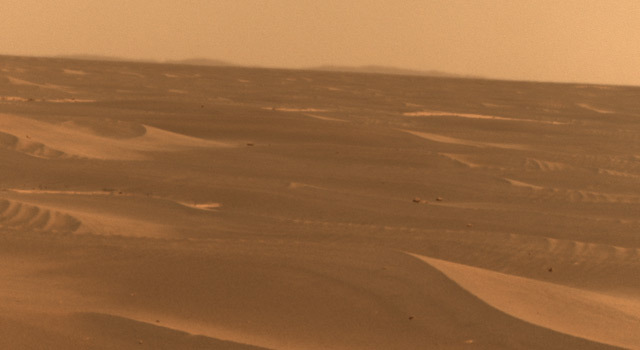 "It was clear from the images that Opportunity took on the approach to Concepción that there was strange stuff on lots of the rocks near the crater," said Steve Squyres of Cornell University, Ithaca, N.Y., principal investigator for Opportunity and its twin rover, Spirit. "There's dark, grayish material coating faces of the rocks and filling fractures in them. At least part of it is composed of blueberries jammed together as close as you could pack them. We've never seen anything like this before." 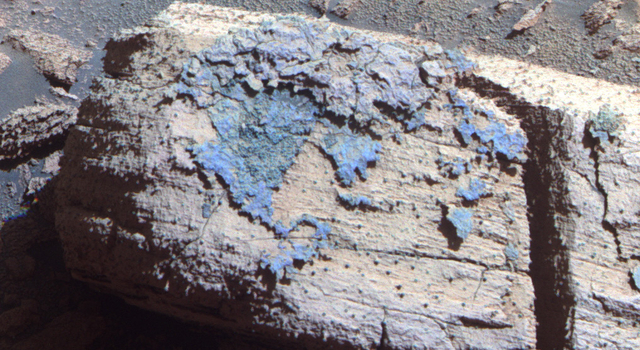 Opportunity used tools on its robotic arm to examine this unusual material on a rock called "Chocolate Hills." In some places, the layer of closely packed spheres lies between thinner, smoother layers. 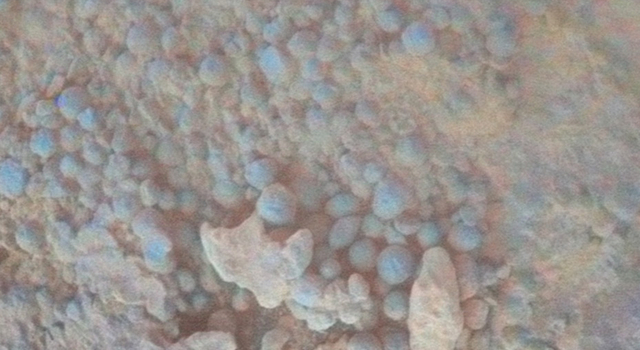 "It looks like a blueberry sandwich," said Matt Golombek, a rover science-team member at NASA's Jet Propulsion Laboratory, Pasadena, Calif. An image of the coating material is at http://photojournal.jpl.nasa.gov/catalog/PIA12970 . The composition Opportunity found for the dark coating material fits at least two hypotheses being evaluated, and possibly others. 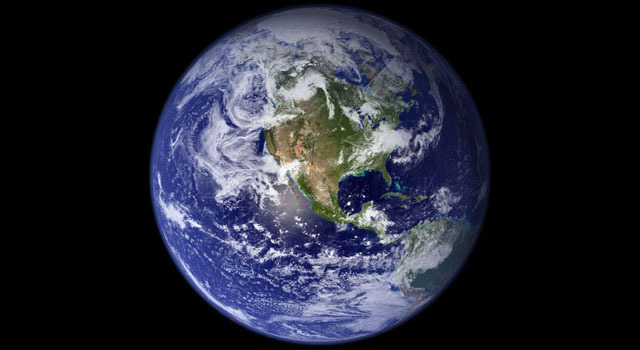 One is that the material resulted from partial melting of blueberry-containing sandstone from the energy of the impact. Another is that it formed from filling of fractures in this type of rock before the impact occurred. "It's possible that when you melt this rock, the sandstone melts before the blueberries do, leaving intact blueberries as part of a melt layer," Squyres said. "As an alternative, we know that this type of rock has fractures and that the sandstone can dissolve. Long ago, water flowing through fractures could have dissolved the sandstone and liberated blueberries that fell down into the fracture and packed together. In this hypothesis, the impact that excavated the crater did not play a role in forming this material, but split rocks along fractures so the material is exposed on the exterior like a coating." The observation that the rocks thrown from the crater have not yet eroded away much is evidence that the crater is young, confirming the suggestion from the dark rays. Squyres said, "We're not ready to attach a number to it, but this is really young. It is the youngest crater we've ever seen with Opportunity and probably the youngest either rover has seen." 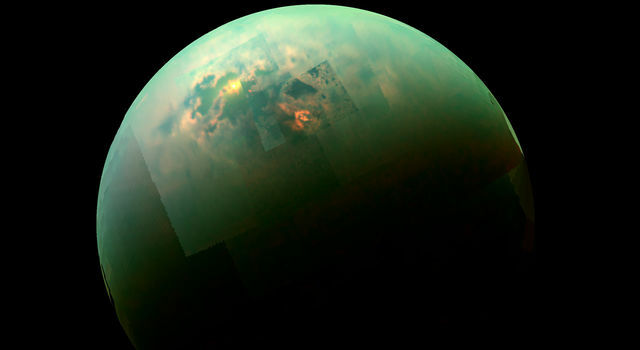 One question Opportunity's visit did answer was about the dark rays: "We wondered before getting to Concepción why the rays are dark," Golombek said. "We found out that the rays are areas with blocks of light-toned sandstone ejected from the crater. They look dark from orbit because of the shadows that the blocks are casting when the orbital images are taken in mid-afternoon." Since departing Concepción on March 9, Opportunity has driven 614 meters (2,014 feet) farther along the route to its long-term destination at Endeavour Crater, about 19 kilometers (12 miles) in diameter and still at a drive distance of more than 12 kilometers (7 miles). Squyres said, "We're on the road again. We have a healthy rover and we have enough power for substantial drives. We want to get to Endeavour with a healthy rover. It takes a compelling target for us to stop and study. And Concepción was a compelling target." 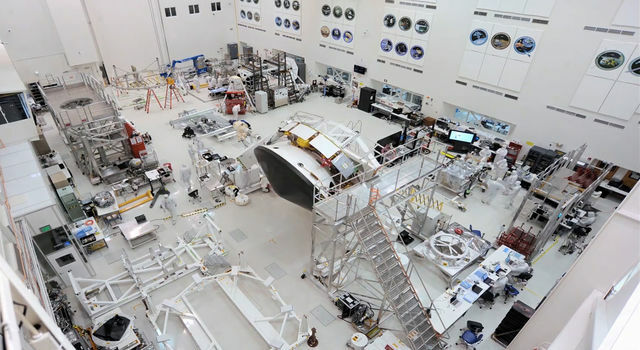 JPL, a division of the California Institute of Technology in Pasadena, manages the Mars Exploration Rover Project for the NASA Science Mission Directorate, Washington. 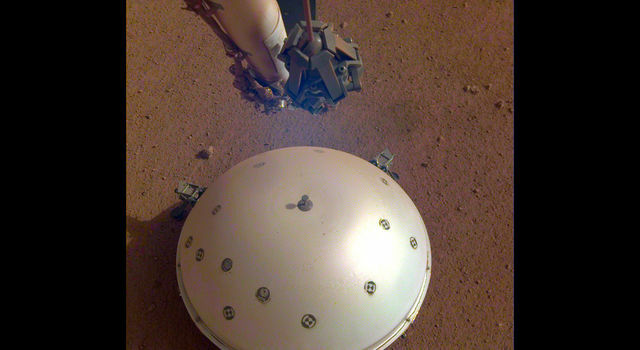 For more information about the Mars rovers, visit http://www.nasa.gov/rovers .